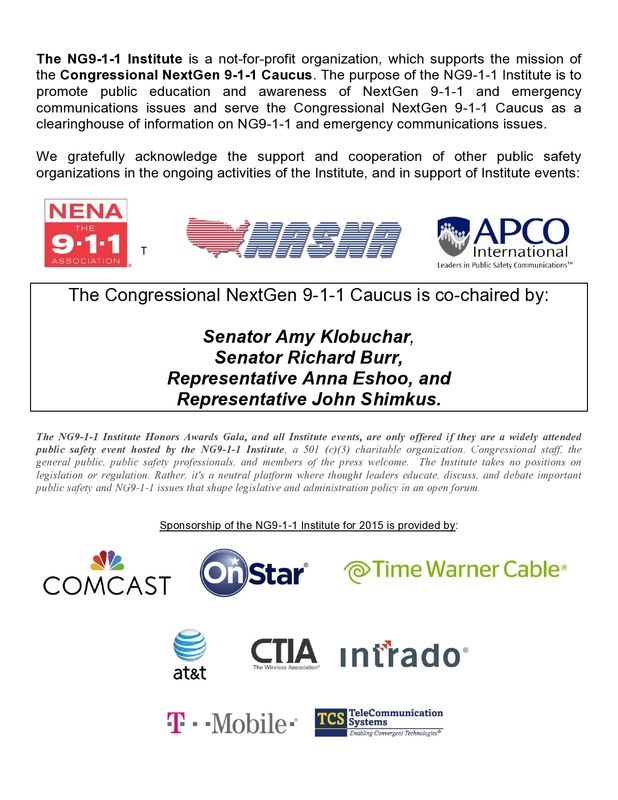 WHO: The NG9-1-1 Institute, a not-for-profit 501(c)(3) organization providing administrative and policy support to the Congressional NextGen 9-1-1 Caucus, and 9-1-1 leaders and heroes from across the United States. Attendees to include members and staff of the Congressional NG9-1-1 Caucus, U.S. Congress, federal agencies, the national public safety community, as well as the general public. SNOPAC Everett, Wash., Represented by Kurt Mills, receiving the NG9-1-1 Public-Private Partnership Award: Recognizes 9-1-1 individuals for professionalism, initiative, creativity, diligence, and teamwork in assisting a person reporting and/or experiencing an emergency situation or solving a critical 9-1-1 issue. Denco Area 9-1-1 District, Lewisville, Texas, Represented by Mark Payne, receiving the Outstanding 9-1-1 Call Center/Program Award: Recognizes a 9-1-1 call center, and a state or regional 9-1-1 program, for overall excellence in serving the public including handling of emergency situations and deployment and management of new technology. Patti Davis/National Public Education Forum, Abilene, Texas, receiving the NG9-1-1 Awareness Award: Recognizes an individual, organization, company, media outlet, program, or other effort(s) to coordinate and promote education and awareness for NG9-1-1, the appropriate use of the 9-1-1 system, or the transition to a Next Gen 9-1-1 system. May include person(s) involved in other areas, such as media or entertainment. David Furth/Federal Communications Commission, Washington, DC, receiving the Government Leader Award: Recognizes a Federal, state, or local government leader displaying the greatest effort to advance capabilities of NG9-1-1 emergency communications. Angelia Dodd (Forth Worth Police), Fort Worth, Texas, receiving the “Citizen in Action”/First Responder Award: Recognizes a citizen, group or first responder demonstrating exceptional bravery and heroism using NG9-1-1. Hank Hunt, (Private Citizen), receiving the “Carla Anderson – Heart of 9-1-1” Advocacy Award: Presented in memory of the Institute’s past Executive Director, Carla Anderson. Recognizes an individual or organization whose contribution to public safety mirrors the passion and commitment demonstrated by Carla for 9-1-1. Foyer – Rayburn House Office Bdlg. Washington, D.C.
Visit. www.ng911institute.org for more information.